Olga Ovdiychuk got an award for the best female footballer for the second year in a row. Even though she is a role model for many, such recognition does not make her rest on her laurels. Instead, it drives her to achieve championship for the team. In this interview Olga tells us how a woman can prove her mettle on the football pitch and why football is not only a men’s game. 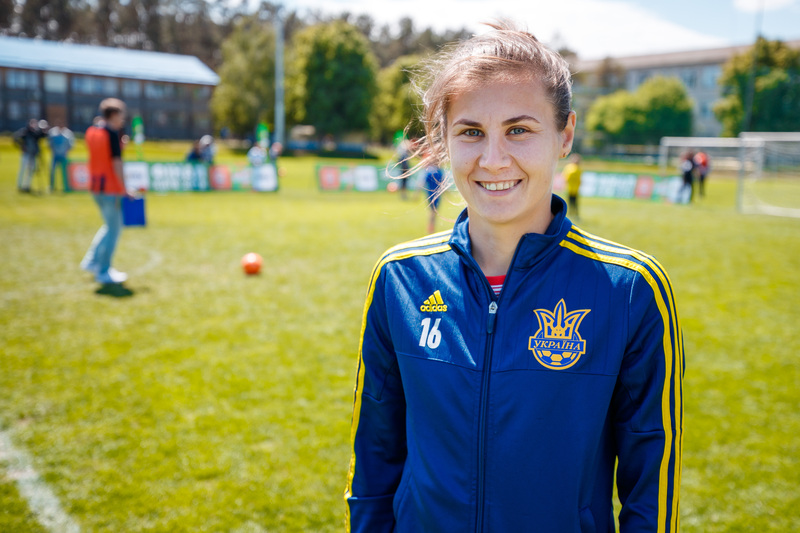 Olga, as a 25- year-old, you repeatedly become the best female football player in Ukraine. Tell us how your football story began. You must have seen guys kicking a football in a yard, right? This is how I started as well – by playing with boys from my yard. At that point I had no clue that women’s football exists. It became a huge revelation a few years after, when I traveled to another city for a football match. Moreover, I discovered there is a women’s football team in my district! Once a coach from Kostopil sports lyceum saw my game and invited to his team. I agreed straightaway. Becoming a member of a women’s team, even thought I was much younger, made me feel even more excited. It was back then that I decided: football is my game. What was your parent’s reaction to such a decision? At first, they were not very thrilled. After having observed my game, both of them claimed that football, a team game, is not for me. In their understanding, some individual type of sport would suit my character far better. They would be way happier, if I tried athletics. But it is so boring to run around in circles by yourself! No, I rather opt for football. Yes, we are girls. So what? Even if we fall down, we stand up and keep on playing. If we have decided to play football professionally, then we are one hundred percent devoted. If you compare men and women playing football, we are equally good. Do you feel any difference in attitudes towards women and men playing professional football? Of course, I do! Men’s football is perceived on a higher level. Their salaries are also significantly higher. They receive thousands in foreign currency while we get 50-100 times less. There is a long way for us to get to the same level. Nevertheless, it does not stop us, because we love football. Yes, it is common thinking that football is not a women’s game. It is not true though. At least, we, professional female footballers, do not think so. What do you think could be done to change this stereotype about football as a men’s game only? How to make it perceived as a women’s game as well? One just has to see both men’s and women’s football. This stereotype developed just because nobody has seen women on the football pitch. And how good they are passing the ball at the pitch. Why has nobody seen? Because people do no go to female matches. So, they should come and make conclusions. This is it. As soon as football fans start coming to our plays, they will understand that football is a women’s game as well. They will see that we play football as good as men do. Maybe, somewhat even better (smiles). I’m happy that Ukraine will host UEFA Women’s Champions League Final. It is a chance for football fans to see their favourite game in a new light. I am sure, after the Final they will absolutely change their mind, realizing that there are not only men in the professional football. When children decide which sport to get involved in, there are not many girls who pick football. They would rather choose ballet or ballroom dancing, because it seems to be more reasonable. How to encourage them to choose football? How to assure that a girl can be a successful football player? It’s not an easy question to answer. While a boy can be compelled and thus assured, such method would never work with a girl. You can’t force her to do something. Some soft power and a special approach are needed. Make her interested in football, so that she gets zest for it herself. Generally speaking, should we encourage children to do sports? Certainly! It does not have to be football necessarily. Whatever they prefer. This is a must for a healthy lifestyle. Doing morning exercise at least and running some 500 meters is already superb for them. Besides the fact that doing sports is healthy, it also fosters one’s character. Which traits have you obtained while playing football? I guess, courage first of all. Persistence. Toughness. In fact, it taught me to deal with life’s difficulties and never concede if you are right. Let me give you a simple example. You are on the football pitch, running with a ball to score. Will you give up the ball to somebody? Of course, you won’t! You will run forward having it, regardless of anything. It relates to a real life as well – you should never give up. There was time when your family dreamt to see you as a track and field athlete. What do they say now, when for a second year in a row you become country’s best female football player? How about your friends, male friends especially? How do they feel about your successes in the professional football? They are proud of me. When I come back home and meet those guys that I began playing with back in childhood, they are all full of excitement: “Wow, Olga, this is so cool that you are playing for a national team! That you are the best there!” They always stand for me and write congrats messages on social media after matches. It is so nice to have such a support team. ​​​​​​​Who are your role models among famous footballers? By the way, are there female players to look up to? When I was a kid, Lionel Messi became my role model. I watched every single match with him, observed every movement and was so excited that got bright-eyed to try it myself. Basically, it was Messi that my passion for football started with. But it was difficult back then with female football players. I simply was not aware of their existence. It is now that I do know. It is now that I look up to a captain of US women’s national soccer team, Karli Lloyd, who has become the best player in the world. Or Pernille Harder, a captain of the Danish national team. In general, when I started traveling abroad to play, I realized that there are a lot of great female footballers to follow and learn from. Maybe, becoming the best female footballer in the championship for two years in a row. But that’s on the national level. It is too early to say about the European one. Those achievements are ahead. How could a girl preserve optimism and energy, when she tries her best to achieve something in the “only for men” sport? Just set goals and move towards them. Never give up. Even when you are in pain or lack strength, seek for words of support. Let it be friends, who tell you that you can. Let it be your relatives, who should be on your side. This is the only way to charge your inner batteries and keep going further. I want to play in the Champion’s League finals. I am currently working on it.